Cambridge favorite Rorotoko, that interviewer of fascinating brainy people, posted a piece on Jerome Kagan today. Kagan has studied child psychology for decades, and has turned his attention to the age-old dilemma of academic divides. His The Three Cultures updates C.P. Snow’s classic The Two Cultures (published by Cambridge in 1959). 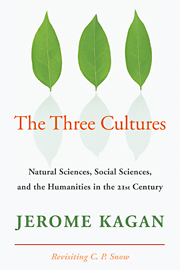 The Three Cultures compares the premises, vocabulary, sources of evidence, contributions, and limitations of the research, scholarship, and theories of natural scientists, social scientists, and humanists. The concepts of physicists, chemists, and biologists refer to things with material features, such as particles, molecules, cells, and neurons. Most social scientists and humanists rely on concepts for events, such as behavior, thought, and emotion, that occur at the end of a cascade of processes that originated in a material brain, but require a special vocabulary that cannot be replaced with biological terms. One group of social scientists avoids phenomena and explanations that have any ethical component. These scholars typically study sensory and perceptual phenomena, some aspects of memory, and motor skills and often try to find correlations of these events with activity in brain circuits. The larger group, more interested in human variation and adaptation to the local society, finds it hard avoiding an ethical preference—the judgment that a person is or is not psychologically adjusted usually requires an evaluation of the qualities that are better or worse than others with respect to some ethical ideal. Furthermore, these scholars rely heavily on words as the primary source of evidence because they frequently use questionnaires and interviews. This practice poses serious problems because words and sentences have unique properties that are not possessed by behaviors, mental images, or private feelings. Scholars in the humanities have most specific missions. One group tries to detect an important change in the ideology of a society or in the meanings of popular concepts and communicates this information to a public that has not yet recognized these new ideas. Others are primarily motivated to generate an aesthetic response in their audiences. Unlike natural and social scientists, humanists cannot perform experiments that can evaluate the validity of their insights. Only the roll of history can perform this judgment. The contributions of the natural sciences, which include better health, longevity, and labor-saving devices, have persuaded the public and the media that natural scientists are entitled to a special status and that judicial, legislative, and even some personal decisions, should be based on factual evidence affirmed by the studies of these intellectuals. This view is seriously flawed. Biologists have established beyond doubt that all male primates, including humans, are naturally sexually promiscuous. But few communities are ready to remove moral and legal sanctions on a man who impregnates a woman who is not his legal spouse. That decision rests on a moral belief – and it is not foolish though it flouts the scientific facts.